Cycling is a great for exercise or leisure, and for the most part, best done without your smartphone. Using one hand for riding is dangerous, and headphones, even more so. However, is a better way to use your phone, and that generally involves a bike mount. This one, Allo, even comes with its own speaker system, so you can cycle to music, get voice-activated directions, or even hear a phone call. 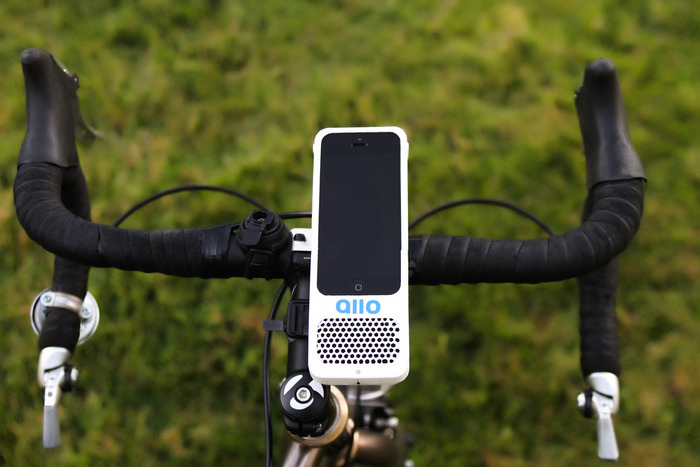 The Allo is made up of two main pieces: the speaker/case and the bike mount. You can secure the mount onto any bike handlebars. The speaker/case piece holds your smartphone and has a top piece that unclips, allowing you to slide your phone into the 3.5 mm jack at the bottom. The speaker/case slides in and out from the bike mount so that the Allo can be used off the bike as well. The speaker is powered by two AAA batteries and has a range of 80-90 decibels. Once the Allo has been attached to the handlebars, simply flick the switch on the bottom to turn on the speaker and you can use your smartphone just like you would normally but now with your bike! The Allo puts everything at your fingertips! Allo is currently on Kickstarter, visit the funding page to get your own. For safety reasons, you should always pay attention to your surroundings, obey traffic laws, and stop when accessing your device.